Nana Akomea, Managing Director of the Inter-City State Transport Company (ISTC) has announced plans to extend its operations to Nigeria and other populous African countries. He said the company was already plying the Togo-Benin-Coted’Ivoire Route and would venture into the Nigerian market. Nana Akomea disclosed this to the Parliamentary Select Committee on Transport which paid a working visit to the company’s head office in Accra. The visit was to ascertain first-hand information about the company’s operations and challenges. The committee toured the company and witnessed the commissioning of the ISTC Driving School by Kweku Ofori Asiamah, Minister of Transport. The driving school has been equipped with state-of-the-art equipment and latest driving technology. 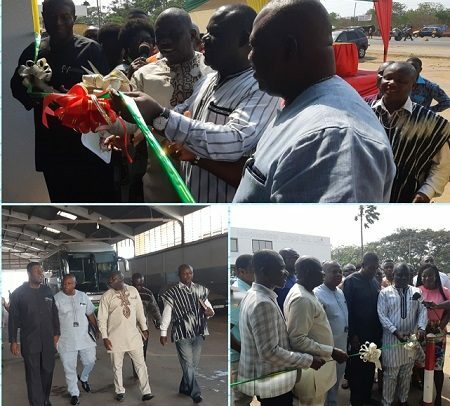 The Transport Minister also inaugurated the ISTC’s new car rental service terminal, which is equipped with modern special utility vehicles for the use by the public. He said though the company faced crisis previously, the committed management and staff turned round the fortunes of the company by increasing productivity and paying debts. The Managing Director revealed that plans were underway to establish stations at Kasoa, Pokuase, Ashaiman to expand the local market in order to lessen the burden of passengers. He said apart from the Asafo terminal, in Kumasi, in Ashanti Region, the company was on course to establish sub-stations at Kejetia and Sofoline and also in the Brong Ahafo, Nothern, Upper East and West Eegions. Nana Akomea said the company was in the process of securing 100 Daewoo customised coaches from China at a cost of $17.5 million to increase its buses to 160. He said from the previous four buses daily on the Accra-Kumasi route, the ISTC now makes more than 20 trips to Kumasi since it moved its operations to Circle and Asafo in Accra and Kumasi respectively. “My administration, with the support of the Board of Directors, is on course to reposition ISTC as the safest and preferred means of road transportation. Samuel Ayeh-Paye, Member of Parliament (MP) for Ayensuano and Chairman of the Committee, commended the management for improving the fortunes of the company. He welcomed the decision to expand their services to both the local and sub-regional markets. Mr. Ayeh-Paye urged the engineers of the company to pay attention to the details of the specifications to ensure that the buses come with their parts and fit for the Ghanaian terrain. He also urged the company’s management to get closer to the committee and make their concerns known for speedy resolution. This, he said, would allow the Committee to be privy to the plans and programmes of the company.